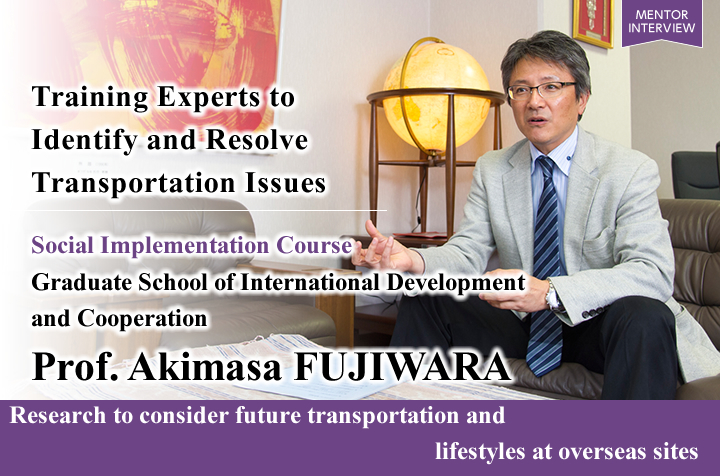 Professor Fujiwara says, “To put it simply, I study ‘transportation urban planning’. Transportation plays an extremely important role in urban planning. For example, my research includes calculations of what level of roads should be built when and where, or what the respective ratios of public transport systems and roads should be, at the same time taking economic activity and environmental impact into consideration”. 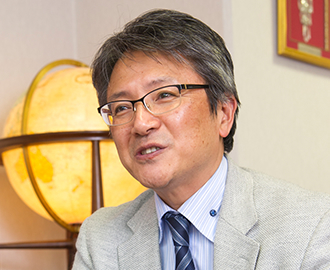 In past research, Professor Fujiwara has also focused on issues related to marginal villages in semi-mountainous regions and new towns that are no longer new (‘old new towns’), proposing measures to improve the living conditions of people living in such areas. “When I speak to older people living in marginal villages, what I find is that in most cases, even if living there is inconvenient, they say that they want to do as little as possible and just leave their assets to the next generation. This is social rejection, in a way. They are being forced to give up on what they want to do. In my research I have proposed that this kind of situation can be changed through transportation”. This research is also being put to use in a project known as the ‘Revitalization of Old New Towns’. The latter is an initiative to revitalize ‘new towns’ where, as time passes, residents have aged and living there has become extremely inconvenient. The aim of the initiative is to bring back convenience to such residential areas. Both projects involve extremely applicable research that broadly publicizes the importance of mobility management. 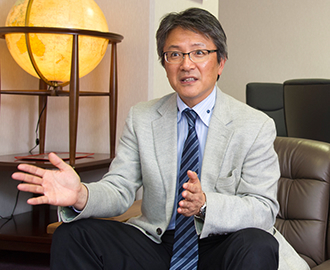 Professor Fujiwara is responsible for two subjects in the Taoyaka Program – Transportation Planning and Debating. “In Transportation Planning, our aim is to conduct research on how to apply existing technology to societies in southern Asia where people are suffering from poverty, or semi-mountainous regions in Japan where people are facing declining birthrates and aging populations. 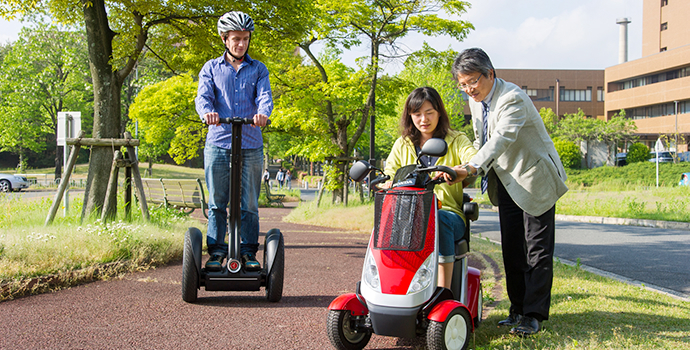 Through this research we hope to contribute to the reduction of such issues”, says Professor Fujiwara. For instance, let’s take autonomous driving technology. If a mechanism that could automatically carry water was applied to a developing nation where people have to climb to the top of a mountain a number of times each day to collect water, the time and labor spent on such efforts could then be devoted to studying or production activities. However, despite the fact that such disadvantaged regions have the greatest need for this technology, currently the technology is extremely expensive and hard to use. On the other hand, in countries where such technology is actually being used, there are already running water systems in place in addition to convenience stores and train systems, and this technology can be purchased relatively cheaply and is easy to use. In other words, as Professor Fujiwara points out, there is a reverse social structure in place, in which the technology that has been developed is not reaching the people who really need it. “I have had serious questions about these things for a long time. So in the Taoyaka Program, we’d like to be able to put in place the necessary technology for the people who are really in need. I think that both developing nations and Japan need the kind of human resources that are able to do this”. Professor Fujiwara says that he has high expectations that the students will make use of their curiosity and sense of adventure to take up the challenge to do this work. 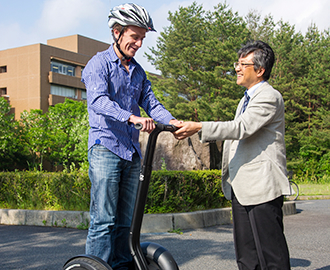 Professor Fujiwara is extremely passionate about the Taoyaka Program. This is because he believes that the research results and various experiences that he has accumulated in the Graduate School for International Development and Cooperation over the past twenty years will be put to great use in the program. “International students make up 70% of the student body in the Graduate School for International Development and Cooperation, which means that it is very close to the educational environment that we originally envisioned for the Taoyaka Program. In the other subject that I’m in charge of, Debating, Japanese students and international students from developing and advanced nations hold discussions in English, and our aim is to have the students develop true communication skills by doing so”. “Thinking about things logically, making instantaneous judgments, and explaining your conclusion clearly – this is a competency required in international society. I want the students to make use of the English communication skills developed in this practical course in all of the subjects they study”. Professor Fujiwara also provides the following explanation of the Onsite Education course, which is comprised of three strands of practical subjects: internships, onsite training and onsite team projects. “In Onsite Education, the students actually go to the disadvantaged regions themselves and conduct research that is applicable to those regions. The key is to get to know the regions and implement practical research. This could be called educational reform of the graduate school concept. Through this program, I hope that we can produce large numbers of doctorate degree graduates who are equipped with skills that will allow them to make a public contribution”, Professor Fujiwara says, smiling.